Cleveland Indians first baseman Carlos Santana (41) hits a two-run home run against the New York Yankees in the fourth inning of Game 4 of the 2017 ALDS at Yankee Stadium. Thursday's three-team trade with the Seattle Mariners and Tampa Bay Rays has given the Cleveland Indians flexibility, both financially and athletically, in 2019. CLEVELAND — CLEVELAND -- After many reports about starting pitching, the Cleveland Indians altered their batting order and infield lineup by striking a three-team deal with the Seattle Mariners and Tampa Bay Rays on the final day of the 2018 Major League Baseball Winter Meetings in Las Vegas. 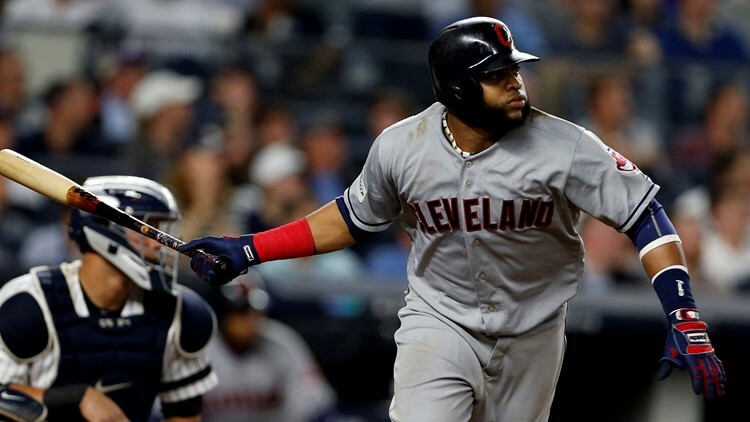 The Indians dealt designated hitter Edwin Encarnacion and a Competitive Balance Round B selection in the 2019 First-Year Player Draft to the Mariners in exchange for their former first baseman, Carlos Santana. The other half of the deal came with the acquisition of first baseman/outfielder Jake Bauers from the Rays for third baseman Yandy Diaz and a player to be named. Here is why the moves make sense for the Indians, who will look to win their fourth consecutive American League Central Division Championship in 2019. 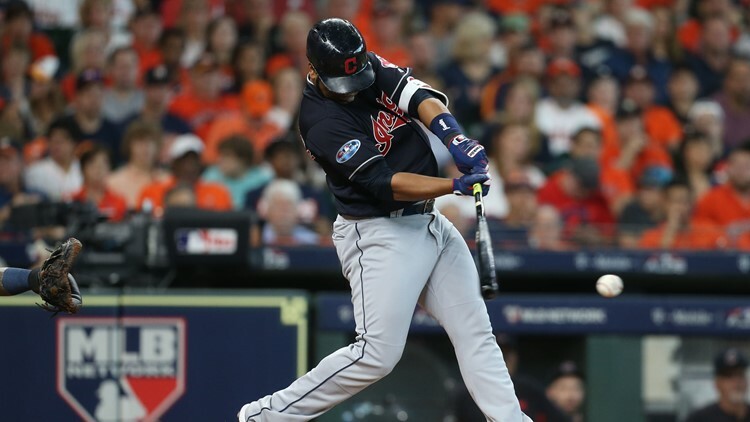 Cleveland Indians designated hitter Edwin Encarnacion (10) hits a single against the Houston Astros during Game 2 of the 2018 ALDS at Minute Maid Park in Houston. The Indians are one of the many teams in MLB looking to reduce payroll this offseason, and while it does not clear all that much space, the trade did free up some cash that will come in handy, especially with hefty raises expected to come in arbitration for pitcher Trevor Bauer and shortstop Francisco Lindor. By dealing away Encarnacion in exchange for Santana, the Indians saved $1.3 million in 2019, as well as $5 million in 2020. If the team kept Encarnacion for 2019, but then, declined his option for the 2020 season, it would have cost them a $5 million buyout. Plus, the Indians got cash considerations back from the Mariners in the deal. With the Indians in 2016, Santana hit .259 with 151 hits in 582 at-bats with 89 runs scored, 87 RBI, 31 doubles, three triples and 34 home runs with 99 walks against 99 strikeouts. Additionally, Santana had .366 on-base and .498 slugging percentages. During the 2017 season, Santana hit .259 with 23 home runs, 37 doubles, 79 runs batted in, another 90 scored and 148 hits over 154 games. Additionally, Santana struck out 94 times, but worked his way to 88 walks. In his eight years with the Indians, Santana had a .249 batting average with 995 hits in 3,994 at-bats over 1,116 regular-season games. He belted 236 doubles, 13 triples and 174 home runs, drove in 587 runs, scored another 573 and drew 726 walks against 812 strikeouts. In 21 playoff appearances with the Indians, Santana had two doubles, four home runs, eight RBI, eight runs scored and 11 walks against 16 strikeouts. Tampa Bay Rays first baseman Jake Bauers (9) hits a three-run homer during the eighth inning against the Oakland Athletics at Tropicana Field in St. Petersburg, Florida. Encarnacion was not the only infielder the Indians were rumored to explore deals for during the Winter Meetings, as first baseman Yonder Alonso reportedly has been placed on the trade block. Should the Indians find a suitor for Alonso, Bauers will give them plenty of flexibility. Bauers can play infield on days when Santana is off or serving as the designated hitter, or he could be a platoon player for a team short on Major League talent in the outfield. 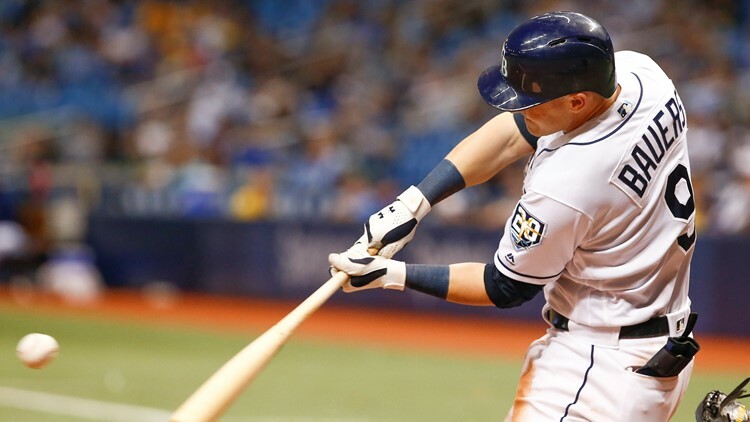 Although Bauers had a .201 batting average in 96 games with the Rays last season, he scored 48 runs, drove in 48 and finished with 35 extra-base hits, including 22 doubles, 11 home runs and two triples. Plus, Bauers drew 54 walks to raise his on-base percentage to .316.